I read your site every day. You provide a major service, thanks so much. I have to say, however, that I don't think the MacBook Air as presented is perfect. And it is sad, as my family and I have owned a whole slew of Macs since 1984 and have made good use of them. No ethernet connection. A fair number of the places (research labs) I have to go to and work do not use wireless as a matter of policy because of data security or interference issues (imagine a large experimental control room with 50+ people working on a wireless net, moving data at top speed all the time). And in many hotels outside the US (e.g. Japan, where I go frequently), a wired connection is offered in every hotel room, but there is no wireless. Non-replaceable battery. I had an iBook battery go belly up on me overseas once and could not get a replacement except by traveling 2+ hours and paying $140 (I did without). Lesson was to have a spare, which is not possible with MacBook Air as configured. Then there is the problem of long air flights - and my company policy is not to pay for business class, so recharging on plane is generally not an option. Battery life like other MacBooks at 5 hours notional (less in real life, like 3 hrs, I suspect). Maybe better if you pay 3K for the flash version ($$$). There are workarounds - you can take an AirPort Express or an external battery (of course, it has to have the proprietary MagSafe connector), but they add weight and bother. You might as well take a regular MacBook plus spare battery at about 5.5 lb. (total cost $1,000-1,100). Now, I find it useful to travel with ever lighter loads. Hassle, and my back. And so, back in November when they were launched, I bought a two pound Asus Eee PC with 4 gig built in flash and Linux built in for $375. Wireless, ethernet, SDHC slot, and 3 USB ports. For $80 I raised the memory to 1 GB (great for Linux), got an additional 16 GB worth of SDHC storage. And I can add a portable USB drive. A spare AC adapter cost $15, a nice case $13. For $60 more I have an external battery (generic for DVD players) that raises battery life to nearly 8 hours. Under Linux, I find that browsing and Open Office are as fast or faster than my iBook 1.3 GHz G4. Geekier than Mac, but not impossible, even for non-engineer types. Yes, screen is small, but okay on the road, and in lab at other end I hook onto a big LCD monitor. Total cost of all the gear less than $500, and weight with everything just a tad over four pounds. The Eee has started what might become a revolution by giving people a cheap Linux (or Windows, if you load it up) machine they can take everywhere. I had hoped Apple would come up with a slicker version of this set up and would have happily forked over ~$1,500 for it. And I think lots of other folks might have done so also. One hopes that the MB Air is only the first of many thin and light (and more open to real world use) laptops from Apple. But I worry that it might be like the iPhone - also too constraining for my use (I use multiple networks and SIM cards overseas, multiple batteries, and I make good use of auto focus on the phone camera). Thanks for sharing your thoughts. Like any computer with a USB port, the MacBook Air can work with a USB-to-ethernet adapter, but it would have been nice to build it into the computer. The battery is a serious issue, as Apple controls the MagSafe connector, making it costly for anyone to create an add-on battery for the MacBook Air. I think Asus is on to something with the Eee PC, especially if they get a 10" model out there. It's affordable, expandable, powerful enough, and secure, thanks to Linux. I hope Apple will see their success and look into making a 10-12" MacBook Air, which is exactly what 12" PowerBook users have been hoping for. I had not heard about the USB-ethernet gizmo when I wrote you; I knew they existed, but the ones I have seen up close were downright clunky (we are talking external power supplies here). Today they are written up all over, with the snark of course about lower speed. I sure hope that Apple gets inspired by Asus's success (which only became visible in December and was not on Apple's decision radar before). Now that I have a tiny Mac compatible with the EEE, I will probably ditch the iBook as my desk/portable work 'puter and get a fully tricked out Mini for the office. I look forward to a hands on review from you or your correspondents on the AirBook. I don't know much about the USB-to-ethernet and USB-to-802.11.x gizmos myself, but they exist and people are happily using them. I'm sure Apple's USB-to-ethernet adapter is bus powered, compact, and not ugly. As for reviewing the MacBook Air, most of what we review is what we've bought for ourselves, and I don't see a lot of our writers buying a MacBook Air. We're low-end for several reasons, and budget is usually one of them. However, one of our writers has contacted Apple about a review unit. We'll see where that goes. Optional USB 10/100 Base-T ethernet adapter. So, wireless is not the only option, just the standard option. Thanks for writing. Yes, you can add a USB-to-ethernet adapter, but it's not a feature of the MacBook Air. I've updated the MBA profile and my article to reflect it. Any computer with USB can "do ethernet" this way. You mention down the list under "No Optical Drive"
"Of course, if the MBA isn't your only Mac, you can rip your DVDs on your desktop Mac or buy (or rent) your videos from the iTunes Store. Except for reinstalling the operating system, as long as you have another computer, you shouldn't need the SuperDrive." You don't even need an optical drive for OS installation. Remote Disc supports Netboot over wireless. How cool is that!? Very cool indeed! I'm learning about Remote Disc as articles pop up on the Web. I'm not so sure Apple does get it. A bit thicker is fine - I want a smaller rectangular surface area - that makes it compact and more versatile - a 12-inch screen is fine. Thanks for writing. Yes, I think the MacBook Air footprint is going to be the biggest obstacle to its acceptance by those using 12" PowerBooks. Some will migrate to the MBA for the screen and weight, others will hold off in hopes of something smaller. I always enjoy your coverage of the PowerBooks and more recently the MacBooks. As I read about the MB Air, and as everyone seems to be drawing the conclusion that this is the replacement for the 12" PowerBook, I'm more inclined to see the MBA as the next PowerBook 2400. It lacks an optical drive, same as the 2400. It is a sub-notebook of extreme light weight and size. I can see that Apple has taken a lesson from the 2400; a full size keyboard where the 2400 was crippled by 80% keys and a cramped layout. I can't help but feel that Apple has stripped away many of the features that made the 2400 a more usable laptop; connectivity, a user swappable battery, PCMCIA, and most importantly upgradable HDD. The 2400 could even be upgraded to a G3. Had Apple not hindered itself by forcing a laptop into a manilla envelope, they could have made the HDD upgradable (possibly even large enough to be useful), provided additional connectivity (video out, additional USB ports). I'm afraid that the market for such a high priced laptop of limited capabilities will meet with appeal only to a limited number of buyers and will more than likely meet the same fate as the 2400 - a capable performer, but ill suited for most consumers. The biggest problem with the 2400 was limited distribution. It was designed for the Japan market and never officially sold in the States, Apple's biggest market. It was intended as a successor to the PowerBook Duo 2300c, which sacrificed a lot of features for portability - just as the MacBook Air does. 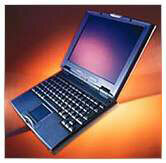 I have to agree with Robert Alpizar, who sees the MBA as the true successor to the PowerBook Duo. All we need is a dock with a USB hub, SuperDrive, video output, etc. that could turn the MacBook Air into a decent desktop computer. No Kensington-style computer lock slot. The MacBook Air will undoubtedly become the most stolen Mac. No memory expansion, not even build-to-order. This is the only Mac available that cannot have at least 4 GB of memory. Memory has historically been the factor that is most limiting and will make the machine obsolete quicker, as countless model pages on LEM can attest. Allegedly the prototypes had a memory expansion slot, so Apple knew. No larger hard disk, not even BTO. Apple's drive suppliers have at least 100 and 120 GB parts available in the same form factor as the 80 GB drive. Where are they in the option list? A consolation prize would have been to add NTFS-style file compression to Leopard, but that didn't happen either. A single USB port. That's awfully constraining. Why didn't Apple spend a little flash ROM on a "bootstrap" for the machine, to let it reload Leopard from the Internet? Leaving aside the jaw-dropping Japanese domestic subnotebooks (e.g. Toshiba RX1: under 2 lb.. with a SuperDrive! ), take a look at what Lenovo has on offer worldwide for comparison: the X61s. (Never mind the Lenovo U110, which ships next month.) The X61s is superior to the MacBook Air in almost every respect: 0.3 lb.. lighter, full set of built-in ports, PC Card and SD slots, memory expansion to 4 GB, faster hard disks up to at least 320 GB, option for wide area networking, and about $460 less expensive even equipped with a larger hard disk than the MBA. The only tangible advantage the MBA has is the screen: LED 13.3 (1280 x 800) versus 12.1 (1024 x 768). But the Lenovo has a matte display and 4:3 aspect ratio, and there are a lot of people who prefer both. The Lenovo does have a wonderful full size illuminated keyboard. Lenovo (and IBM before) have been shipping X models for years, and when you look at what they've done, you quickly realize that Apple's MBA hardware engineering could have been so much more. I'm thinking MBA Revision A is destined for Road Apple status, at least to some degree. Others may disagree, but I'm going to wait for Revision B. The MacBook Air isn't designed for the same users as the MacBook and MacBook Pro. It's meant to complement or supplement a desktop Mac, not replace it. That's why it makes no sense to leave out the SuperDrive in my opinion: Where are you more likely to watch DVDs, at your desk or in the field? The MacBook Air has a built-in microphone, and with no hard drive whine, it should be the best 'Book ever for audio input using the internal mic. The MBA is small enough that you can take it with you almost anywhere, which could make it less likely to be stolen. I don't see a field computer needing more than 2 GB of RAM, although I can definitely see it needing a larger hard drive. A 160 GB hard drive option would have been nice, seeing that Apple uses one in the iPod classic. I agree on the USB port and lack of FireWire. One USB port means you almost need to carry a USB hub, and no FireWire means you can't connect certain digital camcorders, older iPods, or connect the MacBook Air to another computer using Target Disk Mode. I suspect the MacBook Air support netbooting, something Macs have had for about a decade now. It can boot to a Leopard install disk using Remote Disc. Apple has basically reinvented the PowerBook Duo. Now let's hope they get around to reinventing the 12" PowerBook. I was eager to read what you had to say about yesterday's unveilings, and as always you didn't disappoint. I like the way you put everything in perspective, and your analysis of the advantages and shortcomings of the new MacBook Air, as well as the reasoning behind them, is simply impeccable. I would love to know your take on what seems to me the single most impressive innovation unveiled yesterday: Remote Disc. And I wonder whether Apple plans to make the software available for Macs other than the MacBook Air. There's not much written yet about Remote Disc. The program runs on Macs and Windows PCs, and it comes on the Mac OS X installer DVD included with the MacBook Air. According to Apple, once you install Remote Disc, that computer is "permanently enabled for Remote Disc." It sounds like Remote Disc only gives you access to the optical drive on the remote computer, and it appears to be designed specifically so you can run disc-based installers. From what I've read, you can't use the remote drive to burn CDs or watch DVDs. The same probably goes for ripping CDs into iTunes, although there is some speculation that you'll be able to copy files from the remote CD or DVD. That's all we know at present. Commenting on his disappointment with yesterday's announcements, Robert Crane wrote: "Apple makes a profit of a billion dollars a month. The changes listed above pay for themselves in days." I'm sympathetic. Really I am. But there's a problem with the math. I'm not sure what he's using to estimate the costs of the changes he's looking for, but Apple doesn't make a profit of a billion dollars a quarter let alone month. Over the last year, they've averaged about $261M profit per month, across all sources. Mac of the Day: Quadra 605 (Performa 475), introduced 1993.10.18. The least expensive Mac until the $799 iMac gave the LC 68040 power.